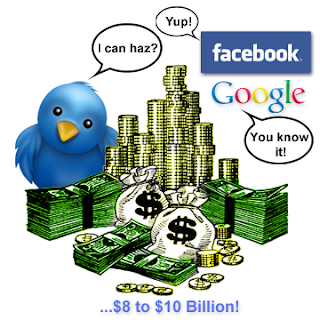 Rumor has it the second time over, that Google and Facebook are in ¡°low level¡± talks with Twitter for business acquisition.? Several businesses and analysts have been thinking of the pros and cons of this move and the impact it will have on the two business giants. Another important point of consideration is the reason a growing business like Twitter might want to sell itself. The answers to these questions are fairly simple really. Caught between two industry giants looking to monopolize the market in their respective domains, twitter cannot establish a spectrum of its own. Besides, reluctant to turn its venture commercial, Twitter incurs growing losses each year. However, as a part of either Facebook or Google, twitter has much to gain in financial terms and otherwise. On the part of these companies, this micro-blogging site, represents a treasure-trove of information that is sure to give these two giants a value added service and in turn more customers. This analysis leads us to the most pertinent question, namely what lessons can we learn to make a strategic business plan for our business development from this occurrence. One of the main learning lessons is that Acquisitions are not all that evil. Off-course they are evil for the employees working there. They are even evil for those at the selling point in certain ways, for they tuck in their feet to sell out on the basic morals and principles that governed their functioning in the first place. However, an acquisition also defines smart business sense, which can save a more drastic result by ¡°holding on¡± rather than selling when there is ¡°still time¡±. When the choice lies between losing jobs completely or having to deal with a new management, what would you rather take? Also as opposed to the popular perception of things, acquisitions does not necessarily mean, a failed business. The case in the point is obviously Twitter, which has new user sign-ups each day. Their add placement on the site lately also suggests that they are not really drowning down. This then is a classic case of ¡°thinking ahead of time¡±. A smart business idea then would be to think ahead, be aware of the ongoing in the businesses you deal in and the approximate outcome result. A new business idea to get from the Google-Facebook-Twitter dealing is to understand that there are newer avenues which always open up for any business no matter its huge success or even faliure. It is upto us to not be drastically bogged down or be scared by the business developments, but to implement new business strategy to move ahead and conquer situations. Susan Smith has over 7 years of experience in promotional products industry with a focus on digital marketing. She oversees the social media strategy for the company and manages product campaigns to build brand awareness. Susan can be followed on Google+ and Twitter. Stories for Brand and Business Building: Tell us your story!